History is where you find it . . . often in bits and pieces . . . a puzzle to be assembled. For this puzzle we have a piece at the beginning (1910) and a piece at the end (2013), but what about the pieces in the middle? 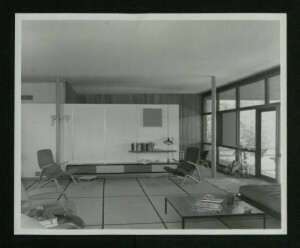 No doubt there are many, but Special Collections holds a significant one, which can be found in the Burdette Keeland Architectural Papers. 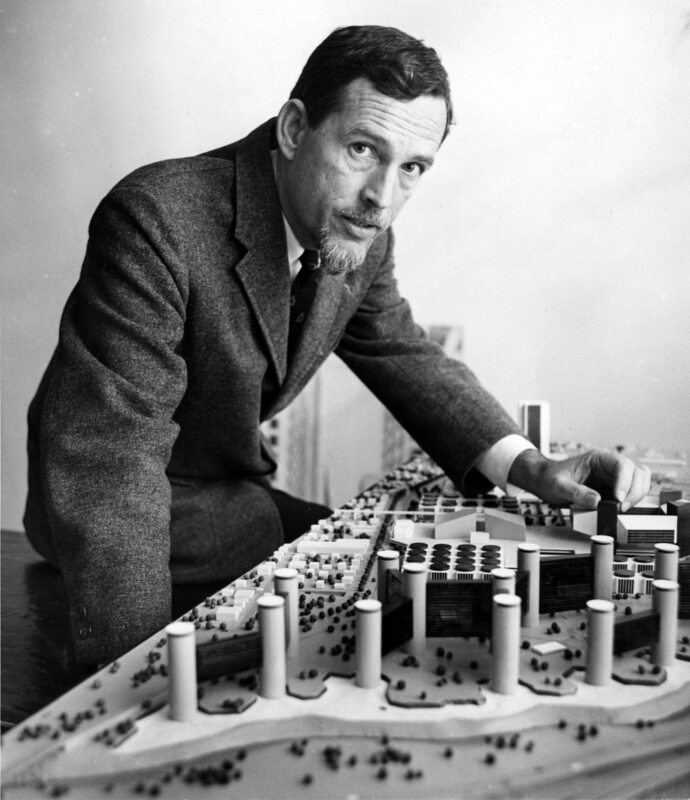 Burdette Keeland (UH 1950) was a prolific designer and an influential member of the UH Architecture faculty. To his students, he was cool. 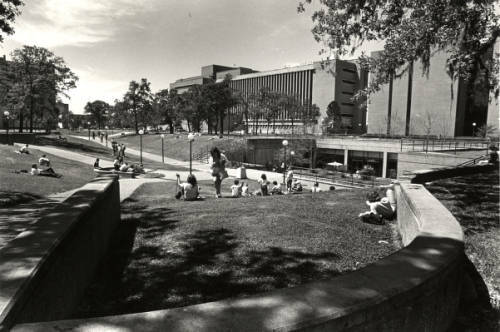 Joe Mashburn, later Dean of the College of Architecture, recalled, “I remember Burdette Keeland, Jr. emerging from his gray MG roadster and walking across that asphalt with his suit jacket over his shoulder and smoking a thin cigar. As students, we thought this was the way it should be for an architect – a cool sports car, a sleek Italian jacket. We wanted to be like him.” (“Burdette Keeland Jr. Remembered,” Cite 48 (Summer 2000), 9). Burdette Keeland, Jr., late 1960s. 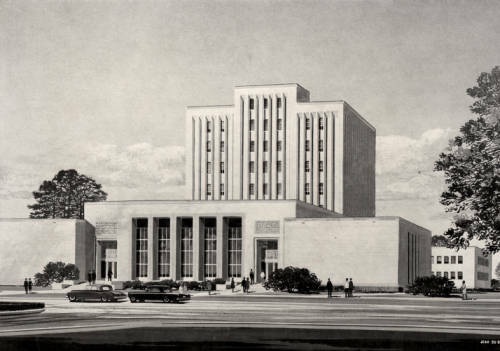 Burdette Keeland Architectural Papers, UH Libraries, Special Collections (“Keeland Papers”). 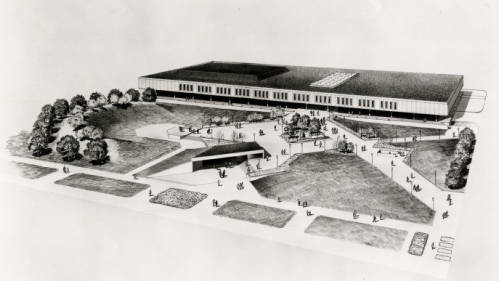 In the late 1960s the cool Mr. Keeland was part of a joint venture that bought what is now known as the Sunset Coffee Building with plans to develop it as an entertainment venue. 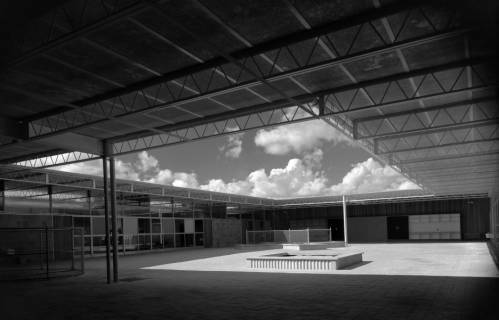 Keeland acted as architect for the group and provided space for a restaurant and two nightclubs. To reach them, he added a three-story outdoor staircase, and in keeping with the spirit of the times, later painted the building in a wild psychedelic color scheme. Love Street Light Circus and Feel Good Machine (c. 1967). Keeland Papers. Sunset Coffee Building with psychedelic paint scheme (c. 1971). Keeland Papers. 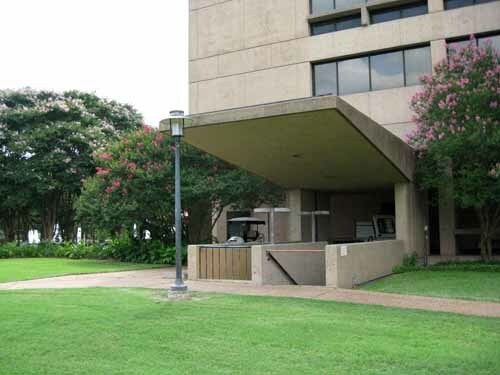 For a few years the building played an important role in Houston’s version of the “Summer of Love,” the heyday of the hippies and the counterculture movement. 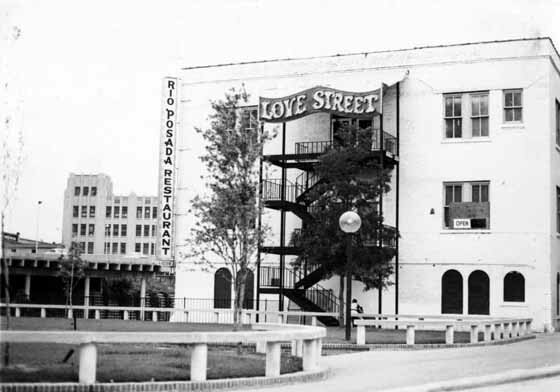 Popular with its patrons but unsuccessful as a business, Love Street closed in 1970. Keeland and his partners later sold the building. It was a short but colorful chapter in the life of this historic building. At Special Collections we have many such chapters, each waiting for researchers to fit them into their proper places in a larger historical puzzle. USGS satellite view of Houston area. 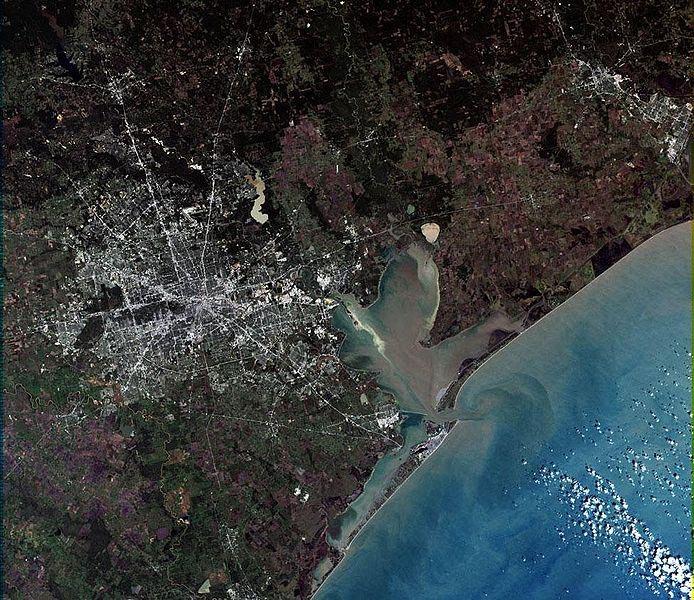 The satellite view is spectacular and confirms what we already know—Houston is big. At last count, Houston’s incorporated area covers about 667 square miles. We know this because the City of Houston Planning & Development Department has created an informative slide show that illustrates the city’s ever-changing boundaries. 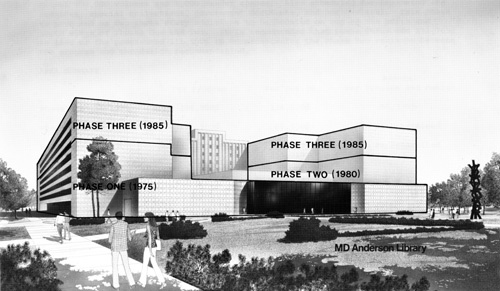 “Annexations in Houston or How we grew to 667 square miles in 175 years” can be found online. 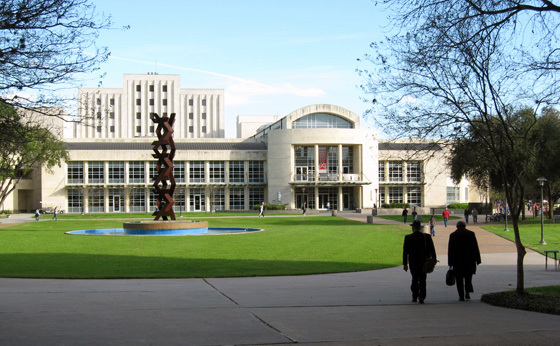 If you want to research urban planning in Houston the old-fashioned way—using text and images printed on paper—try the Special Collections Department at UH Libraries. I recommend the old-fashioned way because, while it is not as convenient as surfing the web, it is way more fun. Discoveries abound in Special Collections. Every folder holds a surprise. 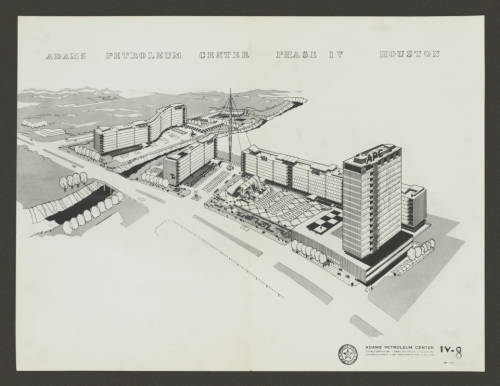 My most recent discovery was a set of maps from the Paddock Greater Houston Convention & Visitors Council Records. 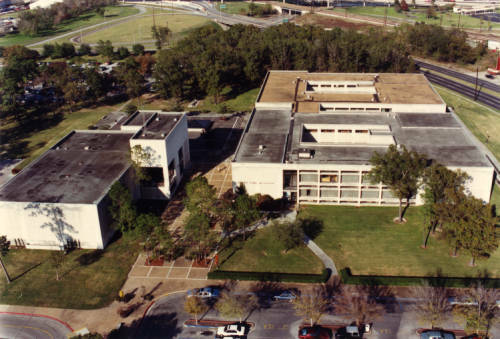 As the name suggests, this collection contains records collected by Marianita Paddock from her years with the Greater Houston Convention & Visitors Council. 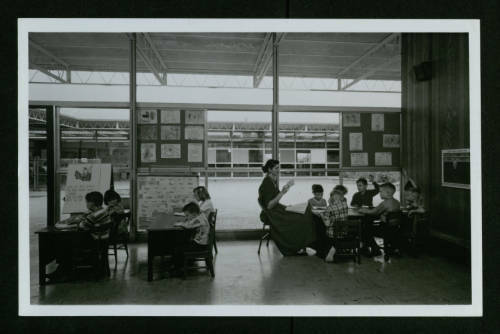 But it also includes maps of cities and counties in Texas from the mid-twentieth century. Some of the maps are common but others are unusual, such as a 1948 Ashburn’s Map of Houston in a special edition issued for Forest Park cemetery on Lawndale. 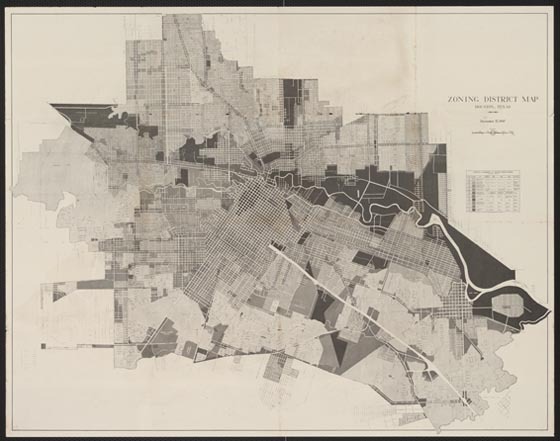 The most significant is the City of Houston’s Zoning District Map, December 15, 1947. 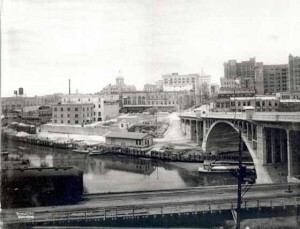 Houston was small once, and I don’t mean when the Allen Brothers founded it in 1836. 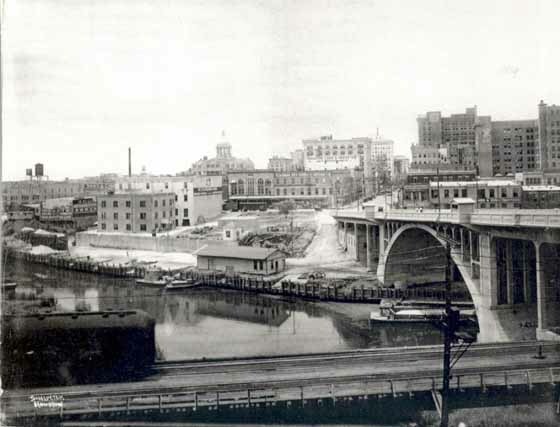 As late as the 1940s, it was a compact city of 75 square miles. This map reminds us that in 1947 the city’s boundaries extended no farther than Kirby Drive on the west, Brays Bayou on the southwest, and Sims Bayou on the southeast. The Heights, Rice Institute, and the new Texas Medical Center were on the edge of town. 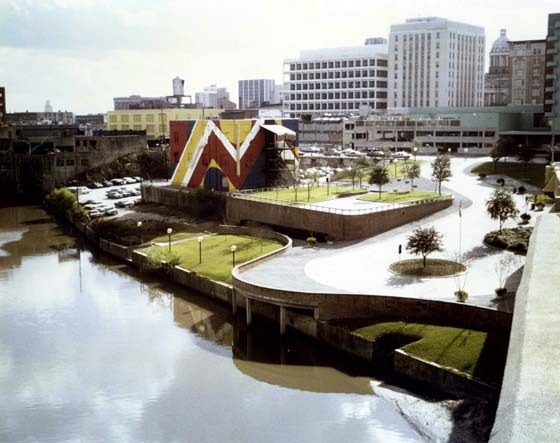 The map is a historical footnote to the larger question of urban planning in Houston. Most people know that Houston is the largest city in the country without land use zoning. So why was the city publishing a zoning map? The answer is that it was done to educate citizens about the issues in the upcoming special election in January 1948 when they would be asked to approve a new law authorizing zoning. It’s no spoiler to say that voters rejected the law. 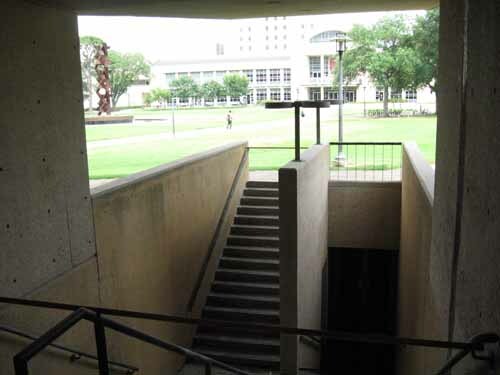 Progressives in Houston are gluttons for punishment and tried again in 1962 and 1993. Voters were unmoved and we still have no zoning. More importantly, the map is a detailed snapshot of the city’s boundaries, street system, and land uses on the eve of its great suburbanization. 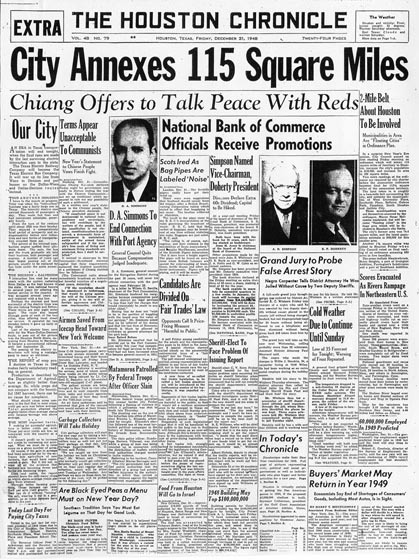 On December 31, 1948, only a year after the map was published, the city council approved an ordinance annexing a large swath of territory that more than doubled the city’s land area to 189 square miles. Houston was small no more. This was the first of many annexations, done to preserve the city’s tax base and its ability to grow. The Houston Chronicle, December 31, 1948. © Houston Chronicle. Used by permission. City council waited until New Year’s Eve to drop this bombshell. The Houston Chronicle responded with a banner headline. Pasadena and other neighboring cities were not thrilled by the news. Their New Year’s hangover was beginning early and would continue for decades more.